Welcome to the Roots + Wings Biz Membership. Please read through the Home page, and find links to the FAQ and Candice's Bio at the bottom. If you still have questions, feel free to Contact Us using the link provided here. Imagine starting off your business journey with access to the type of legal expertise that only wealthy business owners can afford. That's what I'm offering with this program, but on a scale that's affordable and easy. Hi, my name is Candice Aiston, and I’m a business planning lawyer here in Portland, Oregon. I help cautiously optimistic business owners like you to create solid legal foundations and to build responsible business habits, so that you and your family are protected if something goes wrong in your businesses, like an accident, lawsuit, or creditor situation. You have a dream and a purpose, and you're smart and capable and you plan to succeed. I want to help make sure that your dream isn't shattered by a bad situation that you didn't anticipate. Up until now, the kind of legal services I'm talking about have been out of reach financially for most new business owners. 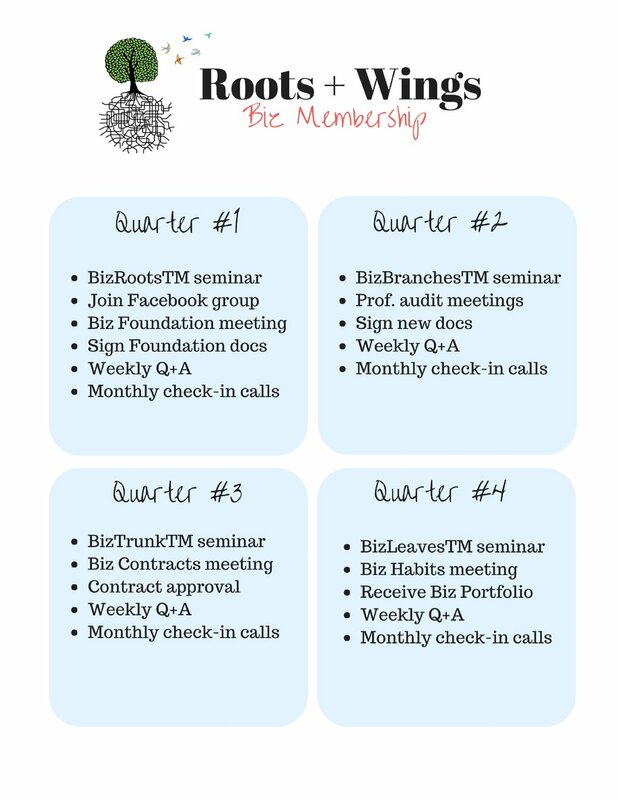 That's why I'm so excited to announce that I'm opening up the waitlist for my brand-new business membership program, Roots + Wings BizTM, which is a year-long program for new business owners, OR for existing business owners who are legally challenged and are ready to get their heads out of the sand now. Imagine starting off your business journey with access to the type of legal expertise that only wealthy businesses owners can afford. That is what I’m offering with this program. Many of my business clients came to me right from the beginning because they're the types of people who needed to know they did everything right before starting. They couldn’t live with the anxiety of not knowing whether they and their families would be protected if something went wrong in the business. Maybe that's you. And many of my clients came to me after having started their businesses and flown by the seat of their pants for a while. Often, these business owners come to see me because they have seen or experienced a conflict that has them scared that they’re not protected. When I help either of these types of clients, I fill in the missing holes in their business foundation, but I also try to help them to create new habits so that they have ongoing protection in their businesses. What we want to do is create a Forcefield around the business so that when there is conflict, you, your family, your assets, and your business are protected. But it’s challenging to help clients to build habits when our work is usually completed in just a month or two. Habits take time to build, and that’s why I decided to make this an immersive one-year program. The program is divided into quarters; each one lasts for three months. In the first quarter, you’ll start with a seminar called BizRootsTM, which is all about legal foundations for your business. I know it sounds boring, but I promise, it’ll be fun. But more importantly, it is VITAL info that you need to know in order to protect your business AND your personal assets, and of course, your FAMILY. In that quarter, we’ll complete your foundational business documents. You’ll meet with me to create your organizational and other important corporate documents. In the second quarter, we’ll kick it off with a seminar called BizBranchesTM, featuring some potential new professional partners. You’ll learn about how to protect your intellectual property, how to protect your business with insurance, and how to protect what you contribute to your business through life insurance. Each of these professional partners will be available to conduct an audit of your IP protection and insurance needs, and I’ll be there with you to help you make these decisions. In the third quarter, we’ll have a seminar called BizTrunkTM, where we’ll learn about the contracts, waivers, and other documents that you’ll need in place to protect your business. We will meet to discuss your personal business needs, create custom contracts, and create a BizToolsTM library you can use to create future contracts. In the final quarter, we’ll have the BizLeavesTM seminar, which is about vital business habits. We’ll hear from a bookkeeper and tax professional about common pitfalls. We’ll complete your annual minutes and send you home with your Business Portfolio. On top of all of these things, there will also be a Facebook group for all members, weekly Facebook live Q+A sessions with me, monthly check-in calls, unlimited calls and emails to me about your business, and too many surprise gifts to name right now. But, if you qualify for this program, you’ll pay just $250/month to be in the Pilot Program. (I’m not sure what I’ll be charging after that.) You can also opt to pay a one-time fee of $2500 up front and save yourself $500. The program for September 2018 is now closed. I am now opening up the waitlist for the program, which will be starting in March 2019. SPACE IS LIMITED. Members will be notified in February if they are accepted into the program. If you would like to be placed on the waitlist for the program, you will need to sign up and fill out an application for the waitlist. Once I receive your application and prequalify you, I will notify you that you’re on the waitlist. Want to learn more about me and the work that I do? Here's my bio page. DISCLAIMER: Candice N. Aiston is licensed to practice law in the State of Oregon only, and does so at her firm, Aiston Law, LLC. In accordance with rules established by the Oregon Rules of Professional Conduct, this website must be labeled "advertising." The information here is not legal advice, and your use of it does not create an attorney-client relationship. © 2008-2018 Candice N. Aiston.